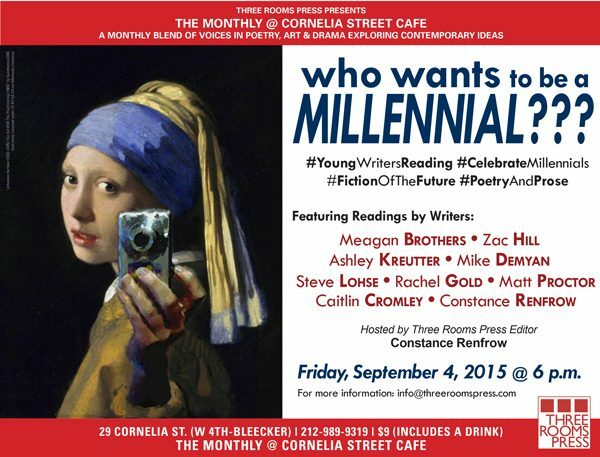 Home→The Monthly at Cornelia Street Cafe→Only 4 More Days until “Who Wants to Be a Millennial?”! That’s right, everybody! Our young writers reading, “Who Wants to Be a Millennial?”, is only a few days away! The event features seven young poets and fiction writers: Meagan Brothers (author of Weird Girl and What’s His Name, Debbie Harry Sings in French, and Supergirl Mixtapes); Zac Hill (COO of The Future Project; former Lead Game Designer, Magic: the Gathering); Mike Demyan (editor, Denim Skin); Ashley Kreutter (poet, New England College); Rachel Gold (MFA candidate at Sarah Lawrence College); Matt Proctor (poet, creator Scenes from a Life); and Constance Renfrow (Editor, Three Rooms Press), who will also host the event.